“There’s a universal ownership of John Paul II. Everyone had an association with him.” – The Rev. Peter J. Karalus, pastor of St. John Paul II Parish in Lake View. The Catholic Church’s newest saint walked the streets of Buffalo and Niagara Falls, slept in a Kaisertown rectory and dined on soup and cabbage inside the home of a Cheektowaga couple. During his epic 26-year tenure as pope, all of the world was a stage for St. John Paul II, who was canonized in Rome this morning. He was the most traveled pope in history and addressed more people, in more places, than anyone else in recorded times. He was especially beloved by many Catholics in this small corner of the globe, where a large and vital Polish-American population felt a strong kinship with the native of Wadowice, Poland. The Catholic Diocese of Buffalo has had a parish in Lake View named after John Paul II since about the time he was beatified in 2011. “I think everybody knew he was on the track to canonization and sainthood. I don’t think three years ago any of us imagined it would be this quick,” said the Rev. Peter J. Karalus, pastor of what was Blessed John Paul II Parish and is now St. John Paul II Parish. Also canonized in today’s ceremony at the Vatican was St. John XXIII, the pope from 1958 to 1963 who launched the Second Vatican Council ushering in dramatic changes in the church. The parish, which was formed from the merger of Our Lady of Perpetual Help and St. Vincent de Paul parishes, has been celebrating the canonization all weekend, culminating with a special Mass at noon today. This canonization is highly unusual both for the speed at which it came about and because it involves a figure of world renown, as opposed to the many saints John Paul II canonized that were known only locally. “There’s a universal ownership of John Paul II. Everyone had an association with him,” said Karalus. Most Catholic churches in the Buffalo Diocese are named after saints, all but a handful of whom lived hundreds of years ago. No one knows what they looked or sounded like, and few people even know much about what they did to deserve saint status. John Paul II died just nine years ago. During his lifetime, his every move seemed to be chronicled, as well as criticized or praised. Fewer people remember the papacy of St. John XXIII, the pope from 1958 to 1963 who also was canonized this morning. But John XXIII’s calling of the historic Second Vatican Council resulted in dramatic changes felt by all Catholics over the past 50 years, including the move in the U.S. to Masses spoken in English. Elected at age 76, John XXIII was expected by many to be a sort of placeholder between Pius XII, his predecessor who had served 19 years, and the next pontiff. Instead, less than a year after his election, he boldly announced plans for an Ecumenical Council, the first in the church since 1869. “Everyone thought he was going to be the rocking-chair pope. He turned out to be the pope who rocked the church,” said the Rev. Kevin O’Neill, who was a seminarian at Christ the King Seminary in Olean when John XXIII was elected. Dolly Ruggiero of Cheektowaga is grateful that John XXIII had the gumption to call together 2,500 bishops and insist that they discuss ways to breathe fresh air into the church. Ruggiero, 80, remembers when priests celebrated Masses in Latin, with their backs turned to the congregation. “All of a sudden, I was seeing a priest’s face, and he would walk down and talk to you and let you feel you were truly part of it,” said Ruggiero. The new way of celebrating Masses inspired Ruggiero to teach religious education. Ruggiero is a member of St. John XXIII Parish in West Seneca, which was formed in 2008 from the merger of St. William and St. Bonaventure parishes, and also celebrated the canonization with a variety of events this weekend, including Mass today. Ruggiero was fond of John Paul II, as well, and she said the canonizations were special to her because they involved contemporaries. “They were two very popular men. We can almost say like we knew them and everything about them, and we did not know that about the other saints,” she said. Catholics believe they can call upon their favorite saints during prayers to intercede with God on their behalf. John Paul II and John XXIII come to Ruggiero’s mind when she prays. Bishop Emeritus Edward U. Kmiec is one of the few people in the world who were around both saints. Kmiec stood in St. Peter’s Square when the former Cardinal Angelo Giuseppe Roncalli of northern Italy was introduced as the pontiff Oct. 28, 1958, and he attended John XXIII’s installation Mass inside St. Peter’s Basilica. Later on, while he was still studying for the priesthood at the North American College in Rome, Kmiec participated as a miter bearer in several papal Masses. Kmiec never exchanged words with John XXIII, but he recalled a special moment observing the pope prior to a Mass inside the basilica. There always was plenty of commotion and pageantry associated with a papal Mass, and at that time, the pope processed into the basilica on a large chair carried by a team of men. John XXIII, who was fully vested in his papal garb, sat down in the chair, folded his hands and bowed his head in prayer, even as a bevy of activity swirled all around him. Like many Western New Yorkers, Kmiec enjoyed even closer links with John Paul II, the man who first appointed Kmiec as an auxiliary bishop in Trenton, N.J., then sent him to be bishop of the Diocese of Nashville and finally to Buffalo in 2004. Kmiec, who will be participating in today’s Mass at St. John Paul II Parish, expressed awe just thinking about it. “Here you have a person who you’ve had an encounter with, and he’s a canonized saint,” he said. During their first meeting, Kmiec told John Paul II that his mother was born in the Diocese of Krakow, not far from where the pontiff grew up. “He put his arm around me and he said, ‘Well, we’re neighbors,’ ” recalled Kmiec, who chuckled at the memory. John Paul II’s connections to Western New York extend all the way back to 1938, when as a young man named Karol Wojtyla he attended college in Krakow with a Felician nun from Buffalo, Sister Tyburcia Szymczak. They grew wider and deeper from there, including visits to Buffalo in 1969 and 1976 when he was a cardinal. Anne Szczesny of Cheektowaga remembered the second visit well, because the cardinal came to her home on Alaska Street for supper. Szczesny’s father, Marian Strzelczyk, who lived upstairs from her and her husband, Leonard, had called and asked if she could prepare something for Monsignor Edward L. Kazmierczak, the pastor of St. Casimir’s Church in Kaisertown, and his guest, the Polish cardinal. Strzelczyk had been a prominent lawyer and judge in Poland, and he was well-known in Buffalo’s Polish community, so he and the Szczesnys often hosted dignitaries in their home. The Szczesnys said they don’t remember exactly what they served, but it probably included homemade soup, cabbage and a pork tenderloin. Visitors were so regular, it didn’t seem like such a big deal at the time. Wojtyla and Strzelczyk talked about politics and the communist rule that forced the lawyer to leave Poland, said Anne Szczesny. The lawyer and the cardinal were born within a few miles of each other, and they also discussed restaurants they had frequented in Poland. The conversation was aided by sips of cognac. “I know we laughed a lot, and he seemed like a really regular fellow,” said Anne Szczesny, a retired teacher. Had she known Wojtyla was destined to be pope, Szczesny said she probably would have taken at least a photograph of the occasion. As it turned out, the cardinal’s 1976 visit to the U.S. raised his international profile, helping set the stage for his unlikely election in 1978 as the first non-Italian pope in more than 400 years. 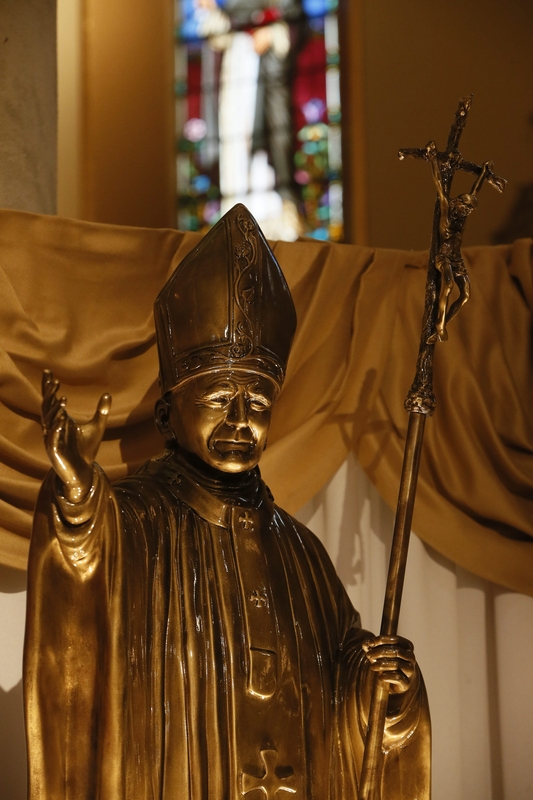 John Paul II never visited Buffalo during his papacy, but Western New York and its residents always seemed to be close to the pontiff. In 1996, he named Monsignor Ronald P. Sciera, a longtime Buffalo priest, as a member of the board of the John Paul II Foundation, a position that brought the priest regularly to Rome for foundation meetings and gatherings with the pope. The pope met with members of the area’s Hope for Tomorrow Foundation, including Dr. Jeffrey Meilman, an Amherst plastic surgeon, and Dr. Amar Atwal, a local eye surgeon, who performed free operations on Polish children and elderly patients. “You knew he was special. You knew you were in the presence of someone of strong moral character,” said Richard Solecki, the former Cheektowaga councilman who met the pope on more than a dozen occasions. Most dramatically, Blasdell resident Ann Odre was struck by a bullet intended for the pope during Mehmet Ali Agca’s assassination attempt in 1981. Both the pontiff and Odre were seriously wounded, and their injuries forever bonded them. They met on three occasions after that fateful day in St. Peter’s Square, greeting each other with hugs and chatting in Polish. In 1987, Western New Yorkers were still in shock over the murders of two priests, the Rev. A. Joseph Bissonette and Monsignor David P. Herlihy, when another Buffalo priest, the Rev. David M. Gallivan, was at the Vatican as part of a delegation of Catholic human service agencies focused on aid in Latin America. Herlihy was Gallivan’s uncle, and Gallivan remembered rehearsing in his mind what he planned to say to John Paul II as he waited in line with bishops and other priests. Gallivan knew he would have only a few seconds of the pope’s attention, and he wanted to ask him to pray for Herlihy and the family members who were grieving his loss. The pope seemed a bit taken aback when Gallivan mentioned that his uncle was a priest who was murdered. “Just then, he lifted his hand, and he said, ‘There were two,’ ” recalled Gallivan, who was stunned that the pontiff knew about what had happened in Buffalo. A photographer caught that very moment on film. Gallivan keeps the photograph in a frame at his home. With or without the picture, though, Gallivan’s memory of the meeting is still vivid 27 years later. “Then I said, ‘I would just ask you to pray for my uncle, and for my mother and my aunt – they’re taking it very hard,” said Gallivan. The pope’s response was unusual. “He said, ‘I will not pray with your family for your uncle. I will pray to your uncle for your family,’ ” John Paul II said, according to Gallivan. The whole conversation was probably no more than a minute, but Gallivan remembers afterward being gently teased by an archbishop from the Dominican Republic about the lengthy amount of time Gallivan was able to spend with the pope, while some prelates that day exchanged just a few seconds of pleasantries with him. “The minute of closeness meant a lot to me. It still does,” said Gallivan.